KUALA LUMPUR (Dec 16): Mead Johnson Nutrition Malaysia (MJN) has advised consumers and retailers nationwide to return its product; Enfalac A+ Step 1 Infant Formula in 1.8kg box for immediate replacement. In a statement yesterday, MJN said the product replacement programme is conducted in light of investigation into counterfeit products, which form a small percentage in a handful of retail outlets in Johor. It said as a precaution, MJN is immediately expanding its current consumer support activities with a voluntary Product Replacement Programme that started yesterday. “Since the counterfeit products cannot be easily and definitively identified without opening the carton, consumer concerns can only be addressed and fully resolved through this Product Replacement Programme. “The goal of the programme is to remove any counterfeit cartons from the marketplace and allow consumers to easily ensure they only have genuine, high quality MJN product that is safe for consumption and fit for use per the product label,” it said. 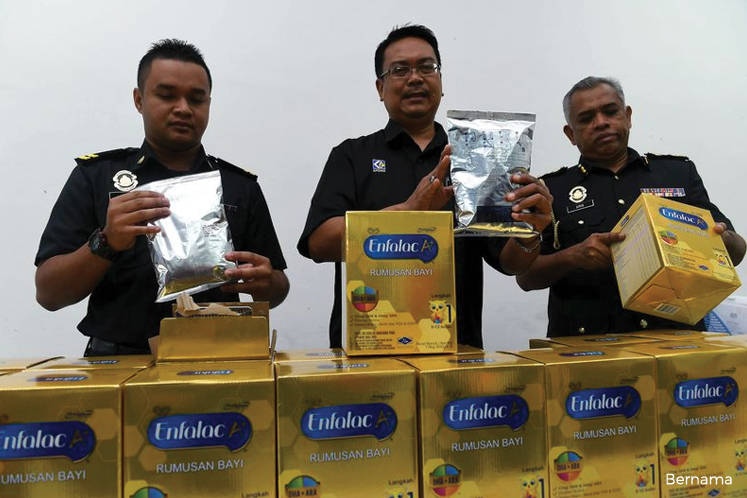 It was reported that 210 boxes of counterfeit baby milk powder were seized in Johor recently. According to the statement, MJN will collect all existing stocks of the products from retail outlets and replace them, in accordance with the mechanics which are now being communicated to retailers. Consumers can call 1-800-88-3585 (Monday-Sunday, 9am to 11pm) or complete an online form at www.enfagrow.com.my to get more details on product return and replacement instructions.